Roger graduated from the University of Sydney with a Bachelor of Health Science (Physiotherapy) in 2014. Since then he’s loved working in the private practice sector – being able to share in the journey of many people’s recoveries, and helping them discover more about how their body moves. Roger gets an absolute kick out of seeing people begin to understand how amazing and integrated the human body is (sharing in the same awe he had when he learnt about these things). 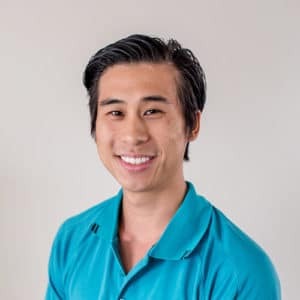 Roger has completed the ConnectTherapyTM Series , Polestar Pilates Rehabilitation Series, dry needling and will be studying Muscle Energy Techniques. He is looking forward to seeing you in the clinic to help you achieve your goals and return to the things you love, whether it be the weekend soccer game or next month’s crochet championship. Outside of work Roger loves to climb! Indoor bouldering is his current game – but would love to progress to outdoor bouldering, sport climbing and even traditional and alpine climbing one day. He loves to try new things – so if anyone has any suggestions of niche sports do let him know! Roger works full-time. He is available for Physiotherapy treatment on Monday/Tuesday/Fridays and teaches PEP sessions on Monday & Tuesday afternoons, Thursday & Saturday mornings.